Back in Rosebud, we had a few hours to relax before a snow storm forced us to turn around and drive back to Rapid City to make our flight. We received so many beautiful presents from the Foss Family, especially 2 handmade Native American star quilts. Pansy made us a money tree! Doesn't look like much, but it was cold, icy and windy. Drastic change of outfits from 2 days earlier. Our trusty truck, complete with curtains, memory foam bed and blankets kept us warm as we slept in the back at the airport parking lot. The roads were fine, except for a long stretch of ice near Rapid, and our flight left on time to take us to the next celebration. There aren't many options in central South Dakota for honeymooners. The short list: Badlands National Park, hunting cabins filled with hunters, or the casino in Rosebud. We loaded up the truck and drove to the Black Hills to quaint little Deadwood, home of Wild Bill Hickok and Calamity Jane. What more could a girl want? James's sister Jenny gave us this Native American wedding vase. It's symbolism is similar to wedding bands, the joining of two lives. Note: it's easier to take turns drinking from opposite sides. And it was dead. 7:00 a.m. jetlag got the best of us and the streets of Deadwood looked like this. The next day it snowed 15 inches. After living in Japan, you don't really know what to do with yourself in such space. We won 10 bucks, called it a good omen to the start of a marriage, got back in the truck and drove back 4 hours to Rosebud. James's family threw us a lovely party at his parent's house in Mission. His brothers Joe, Gary, and Richard and his sisters Roseann and Jenny came from all around the country to help us celebrate. A reminder in St. Francis, South Dakota on the rez. Slightly posed because I couldn't get on the bike in that tight dress. Pansy went out of her way to make us feel loved and welcomed. There was so much delicious food, wonderful people and so many thoughtful gifts. She even ordered a delicious carrot cake wedding cake for us. My favorite! 4 year old nephew John-John took this picture. I love the starkness of the prairies. The ceremony at St. Charles Borromeo church was an hour long...which is exactly as long as James slept the night before due to writing a paper for his university classes. Unfortunately it's a bit blurry, but James and I walked down the aisle together. Father Tim read our vows. James's mom thinks he looks like he's sleepwalking. The church is amazingly detailed in Native American design. The beautiful stained glass windows from Germany were being cleaned, leaving us with the storm windows. My beautiful sister Emma (and her little baking bun). Can you see the peace pipe on the altar? James's sisters Jenny and Roseann, and mom Pansy, with my sister, Emma. James likes this picture of the women in his life. The purple church! Years ago the church was plagued with graffiti. The priests asked the kids what color they wanted the church to be. The kids said purple and *voila* no more graffiti! Driving away in the Volvo 1800. The closest town to Mission, South Dakota, where James's family lives, is Valentine, Nebraska, about 40 minutes away. My sister and I stayed there the night before the wedding. She helped keep me sane as I got dressed, purchased flowers from a couple of heaven-sent florists, and had lunch at the local chuck-wagon. Painted hearts on Valentine's downtown streets. How many people make their bouquet in the back of the car on the way to the church? Thanks Beau and Emma for driving. Disappointingly, they got stuck in Cheyenne, Wyoming for 4 days and missed the second celebration. I'm not sure if I can accurately tell the story of our wedding to do all the love and craziness of the 2 weeks justice, but I'll share a few pictures to try to give you a glimpse into what we felt in our hearts was a beautiful event. Our wedding was a bit nutty, a bit last minute, a bit simple, and very much us, filled with a whole lot o' lovin from our friends and family. At the Rapid City Courthouse. All the important events in life, under one roof. Divorce is too expensive to list. You'll notice through all of these pictures that the sun seemed to shine on us wherever we went. Reveling in the grandiosity of Costco. Jumbo cheese balls buckets and cheap Budweiser. God Bless America. In Badlands National Park in central South Dakota on our way to James's parents house. My Tokyo girls went all out and threw a party for my bachelorette party the week before we left. 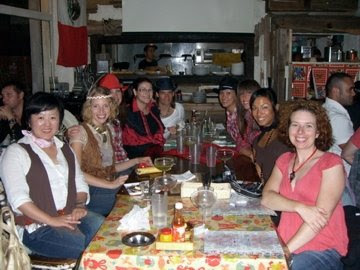 To honor my new family heritage, they dressed me as a Native American princess and themselves as cowgirls. So classy, girls. We started at a great Mexican restaurant called Junkadelic in Naka-Meguro then went to a great beer bar before meeting up with James's bachelor party at a club in Roppongi till the break of dawn. Charity, the brains behind the fun.